This is one of my favorite fall looks year after year. Maxi dresses are the perfect summer-to-fall transitional piece for your wardrobe. You can layer a cardigan or jacket (like this denim one) and add a scarf for an easy fall look. It’s also a great fall style because it is easy to adjust it to the temperatures. On more summery fall days stick with a light weight cardigan and scarf, but on cooler days add a jacket and blanket scarf. The key to transitioning your maxi dress into the fall is to choose your dress / dresses wisely. Maxi dresses made of lighter materials such as chiffon should be left for the summer months. Cotton dresses, in contrast, are perfect to wear in the fall. Dresses in solid colors such as navy, black or red are easiest to style for fall. This has been an odd work week for me, having both yesterday & today as office days. It’s been great to actually catch up on paper work & emails, but I do struggle with not getting distracted at my desk. Hopefully today I can buckle down and then start my weekend early! I hope you start your weekend early, too. This turned out so chic and I have to try it with one of my plain jersey maxis. Such a cute scarf. And I love how the front door area of your home, looks, Lee. Such a pretty wreath and I am loving the bucket of potatoes too, nice touch. 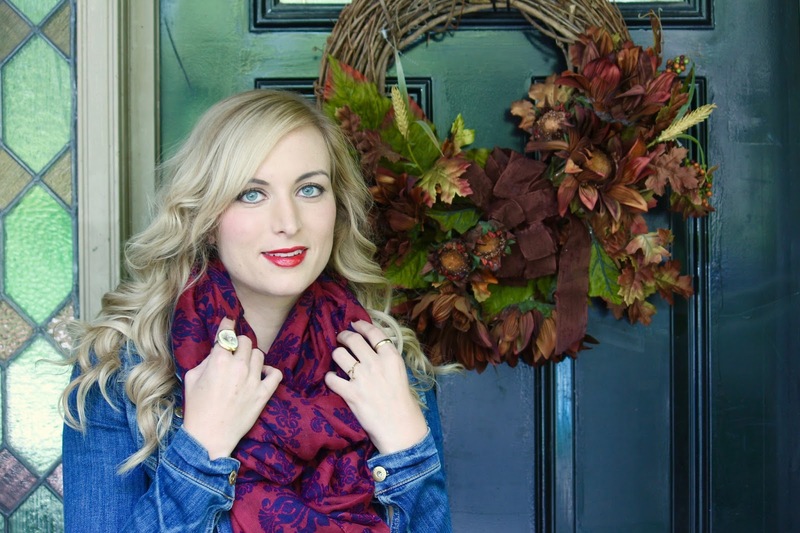 Come share your awesome style with me on my Thursday Linkup. A brand-new one is live this week, pretty lady. I'd love for you to join it. Thank you and have a great weekend! 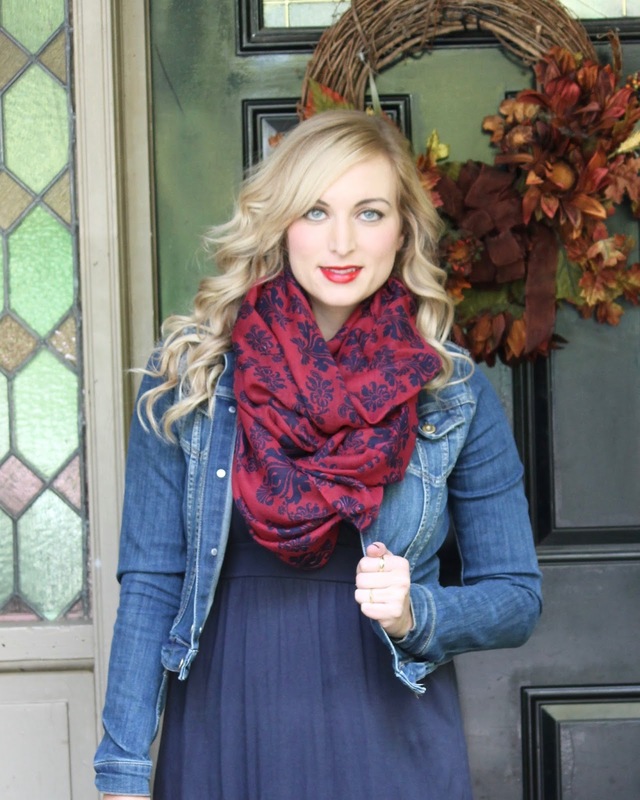 And yes, you totally do – a scarf and jean jacket with a jersey maxi is perfect! Gorgeous photos, Lee! I really like the print and colors of your scarf. I love transitioning maxi dresses for fall with denim jackets and scarves, so this post really caught my eye. Thanks for linking up with Fabulous Friday. Thank you Jennie! Aw Im so glad you like it! 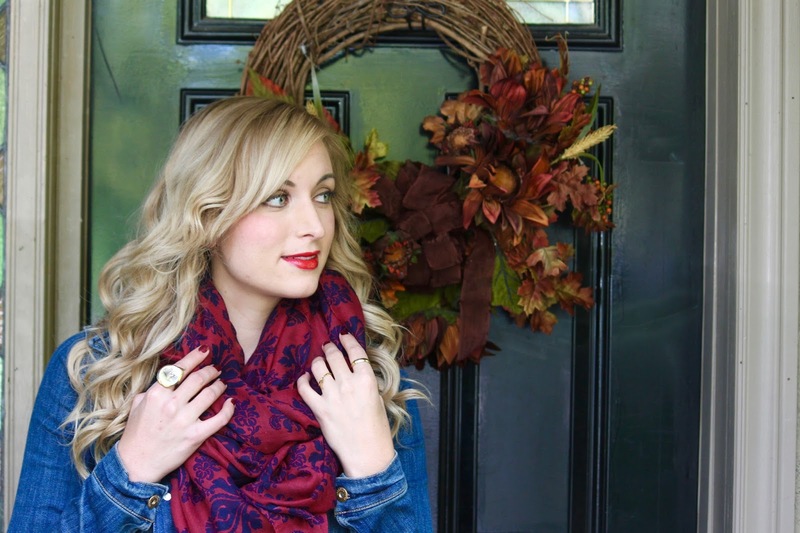 It is SUCH a great (and easy) way to transition into fall! I love this look! Maxi dresses are a perfect transitional piece with so many different ways to style. I love using scarves and cardigans to transition some of my more summery pieces! You look beautiful! I love the idea of maxi dresses in fall. It def provides some extra warmth while looking feminine. Thank you so much Felicia! And agreed! Its such a great layering look.